So Common Core Means Career Ready Which Means Global Competence? Guess what? Those troubling Career Ready Practices we had already noticed as requiring that schools create a community first mindset in each student (June 25, Birth to Career) were celebrated in an Ed Week article this week. It advocates for the rather misguided belief that the US needs a K-12 system “aligned to workforce needs” and that “will propel this country forward.” Only off a cliff. I really need to send the Asia Society those posts on Mind Arson and creating genuine innovation. So now Global Competence equals those Career Ready Practices that treat employment as something people get together to do to earn a living with a magic paycheck producing machine somewhere in the background to reward time put in? I found this nice virtual graphic for you we can call Pretty In Pink to illustrate what the Ed Reformers envision as the Globally Competent Student. Try not to break into laughter or cry when you see the absurdity of this vision. http://www.smithsonianconference.org/shout/vgf-global-competence/ So after years of a very expensive education the goal is to have a young adult who can Take Perspective and have a Global Consciousness and Understand Cultural Interactions. Really? And who is ready to Investigate World and Communicate Ideas. And apparently the communication can be multimedia. The graphic explicitly suggests that students learn to “Use Art to Make a Point, To Make a Difference.” Anyone else wondering what ed reformers think economies will be based on in the 21st century? I am definitely thinking this is more confirmation that they envision returning to a Mercantile “People must Buy Whatever We Produce” economy. That’s not the type that created the Apple I-Pad. Now this is especially rich. The author, Heather Singmaster, bemoans the lack of an explicit Take Action component to Career Ready Practices making me wonder yet again where she thinks everyone will be working. Who has money in their budget to pay for employees who “act personally, collaboratively and reflect” about problems like “Hiroshima and Nagasaki?” Apparently the Globally Competent citizen will be taught nothing about World War II or probably World War I either. But somehow will be ready for work after sitting around and discussing whether atomic weapons should have been used to end the war against Japan without invading that island. Not to be mean, but do we really want to encourage students to believe that their personal opinion matters if it is grounded in ignorance of the relevant history surrounding the event being discussed? Isn’t Global Competence of the type being envisioned about what 21st Century students Feel and Believe, not what anyone is being encouraged to actually Know? How can that create employees ready for the workplace? Once again all these education changes are premised on a radically new economic vision for the 21st Century. Have you noticed that reality of Common Core keeps being omitted in the sales pitch? Only in side articles do we get reminded that the planned Globally Competent citizen the Common Core will produce is to be “boundless in their ideas and endeavors to stimulate positive economic change.” Positive for who? The average person? This is daffy stuff to base a country’s future on but I think the real answer to the economic shift planned tracks back to that communitarian emphasis in the Career Ready Practices. Yesterday I went back and looked at the New Economics that went along with that vision. It was definitely a reminder of why social and emotional learning is so vital to changing people. And why we should think long and hard about turning over our children to administrators whose education degrees are based on implementing the theory that there is a “myth of the individual as thinker and decision-maker.” What ! The central idea is you use the school to create students who think in terms of We, not I. Who will recognize an obligation to “sustain one another’s emotional stability and inner security” and that a cooperative economy can be built around this relationships-first emphasis. Not only is this horribly misguided and a terrible theory to be putting in place as a national research project, but it shows a tragic ignorance of history. Late 19th Century Germany is the prime example of what happens when you try to cultivate a sense of collective obligation grounded in emotion. A better knowledge of history would set off multiple alarm bells on what happens when this “hearts and minds” vision gains legitimacy. In honor of the upcoming holiday, I am going to pause the march toward the real meaning of “college ready” as the other primary goal of the Common Core national education reforms. There have been so many out of the blue explicit confirmations of earlier posts and points in just the last week. In some cases things that the author probably would not have said so clearly if they were aware of what I have already written about the real implementation. And the true goals once you strip away the phrases that sound good but actually mean something else. So I am going to post shorter and more often to illustrate and reenforce some of the points we have already talked about. Ground Zero for the initiative to push social and emotional learning in the schools is a Chicago-based center called CASEL, the Collaborative for Academic, Social, and Emotional Learning. http://casel.org/ Now for years CASEL lobbied both state legislatures and Congress to enact legislation to mandate SEL for the schools. Apart from Illinois, it went nowhere because parents and taxpayers were uncomfortable with such intrusions. Also many parents still remembered the story of a tragic suicide in Pennsylvania more than 20 years ago after emotionally manipulative curricula were piloted in the schools there. Oh good. That certainly is a new, unappreciated definition of student achievement. It explains the administrative excitement over a new definition of student success. I don’t think the parents or taxpayers would be so pleased if they really appreciated what is to be going on at school under the new Common Core. Sounds also like the parents are targets too. Might want to be careful about signing up for parent training luncheons. Unless you want to go and take notes for me. Now let’s suppose you are a international bureaucrat or a politician or just a social justice dreamer hoping that utopia is possible if you could just get to the children at an early age. Reframe how they think. Or Make Sure they mostly feel and respond by instinct. To visual differences. You could influence What each child Values. What they Believe. Their Attitudes. You could actually sculpt the filtering Mindset they use to approach life. But you live and work in a country like the US that was built on the concept that each individual matters. That owes its unprecedented prosperity to personal liberty and economic freedom. In fact there’s a Constitution that says it’s the individual who retains the ultimate authority. Now would you be honest and forthright if you wanted to create such a mindset? Not if you wanted success. You would approach your revolutionary mission of transformation with the stealth of a cat burglar hoping that no one noticed the missing family heirlooms until they were safely pawned. Rather than the bank robber who takes what they wish with guns blazing even while they wear a mask. And that’s the approach the Gypsy Principals and Supers take as they push whatever education policies and practices their professors and the regional accreditation agencies desire. Now we now know the regional accreditors are pushing UNESCO’s policies and that they are in a position to use the horrendous loss in property values in any school district that loses accreditation to coerce school boards. What you may not appreciate is that they have a comparable power of coercion over higher ed. There they can threaten losing the right to participate in the federal student loan program. A death blow to any institutions operations these days. So the regional accreditors and their primary holding company, AdvancED, have tremendous power to advance UNESCO’s social aims for education in the US. And UNESCO’s primary aim is to ensure that all people “integrate the values inherent in sustainable development into all aspects of learning to encourage changes in attitudes and behavior that allow for a more sustainable and just society for all.” That’s right. The people who brought you the Oil for Food scandal and other atrocities because they really are not accountable to anyone and live their life with a non-taxed salary and expense account that you help pay for will decide what are desired values and what will be sustainable and just. Not to worry though these bureaucrats have shown superlative judgment so far. NOT. Yea. That’s a darn intrusive aspiration into what should be an impenetrable zone of liberty and autonomy. In fact if you look up the word “totalitarian” in the dictionary, the marker that crosses the line is targeting personal beliefs, emotions, and values. Which means you had best use a different rationale and start early. Which is why I found it so interesting recently that Head Start just added social and emotional learning components to their federally funded programs. And that AdvancED had created preschool accreditation standards recently. And when that GSBA program I was at last week kept mentioning the “Birth to Work Pipeline,” I noticed that too. Especially when one of the rationales offered for such early interventions by government programs was the “Disparities in Early Vocabulary Growth” between Welfare Families and Professional Families. That can’t be fixed with a government program unless they will be hiring doctors and lawyers to engage the disadvantaged children in conversations. No but it can create a program where publicly paid employees can push whatever beliefs anyone seeking to preserve or obtain political power wishes. Without real constraints. Note to presenters: The Disparities in Early Vocabulary Growth rationale does not go over well with someone who knows how hard the colleges of education and UNESCO are working to limit literacy to a basic functional level. That was a Big Red Flag something else was afoot. Now we have already talked about social and emotional learning generally and Purple America in particular. Let me just remind you that every economic historian recognizes that it is the dominant mindset of a people that governs whether they have the sense of independence that fosters widespread prosperity or whether they look to others to take care of them as if they were serfs or sheep or any subjugated people. Every dictator in history knew this mattered and aspired to influence the prevailing mindset. Because we still have elections though, we Americans are not giving educational policies and practices and the actions of administrators the scrutiny they merit. And we are running out of time. I have written a lot about how the Common Core implementation looks hugely different from the PR sales campaign used to gain adoption. Part of that pitch is to get ALL students College and Career Ready. In the next post I will tell you how this will affect college. It is the Career Ready Practices I want to talk to you about today. This once again looks like a classic Bait and Switch. A cat burglar ploy to avoid detection. Terminology that sounds beneficial but hides a troubling real aim. http://www.careertech.org/career-technical-education/cctc/ is a document called the Common Career Technical Core. It contains the vocational Career Pathways I hate but that’s another post too. At the bottom of page 1 through the top of Page 3 you will see “Career Ready Practices.” That’s the main goal of Common Core so these practices (that no one is likely to read as this is a side but official document) reflect what the ed schemers plan to do or the beliefs they hope to create. Read through them. It sounds like they were written for a robot by someone who has spent their working career getting paid for showing up and doing as they are told. They were written with no concept of how the private sector works. Of coming up with desired products and services. Career Ready Practices is a world where employment is about going through the motions of activities in an imaginary unprofitable workplace. Now does anyone question we are finding the mechanisms for quietly achieving that UNESCO goal of changing our values and behavior’s to a more collectivist approach? Do you feel like a pawn in a troubling global game yet? Who is Really in Charge–the School Board, the Super, the Accreditors, or UNESCO? I have been asking myself that question since before the Gypsy Super in my own district made it clear he did not think he answered to anyone. It is consistent with stories I have been hearing from other school districts. Even in other states. It is an issue with that duplicitous district charter agreement we have talked about previously that appears to be a deliberate distortion of expressed taxpayer wishes. It also comes up sometimes when I am in a meeting and hear a school board member use an official ed term in a way that tells me that someone has misled them on the actual meaning of the term. I think of school board members as custodians of the public interest in how the district operates. Fiduciaries of how all that taxpayer money is spent and what vision for the students is being pushed. That’s why I find the fact that the accreditors feel free to threaten them for differences in policy or holding public meetings or dictating who may be their lawyers to be so alarming. And that was before I discovered the alliance between accreditation and UNESCO’s formal push away from the transmission of knowledge. That the accreditors were the enforcers for an international commitment to limit what individuals can know or do. To almost literally place mental chains and shackles upon the human mind. To make it politically malleable and subject to the herd instinct. 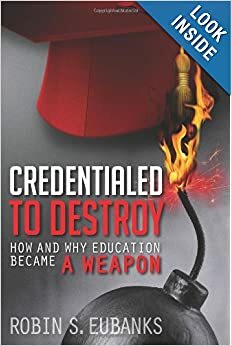 I don’t know why I was surprised to learn that it was the accreditors who ran the 8 Year Study we have talked about that launched outcomes based education and the use of education as an assault weapon to transform the essence of what had made America great. Quietly and without our permission. The accreditation process then has for decades been a cobra ready to pounce to promote a radically different social vision for America. And now globally. So when I got the opportunity to listen in on what school board and legislative candidates supposedly needed to know about education put on by the state school board association, I cleared my afternoon and went. Fresh notebook and pack of pens in hand. And what did I hear? “Must defer to the superintendent. Must defer to the superintendent” over and over again. Like a mantra. In fact creating that belief and expectation seemed to have been a primary purpose of the meeting in the first place. When you elect a school board member do you expect that their authority is limited to the budget and taxes and hiring and firing the super? Now after everything I have written about the real incentives and conflicts of interest and agenda for education, it is scary for both the students and the taxpayers if the accreditors and supers have that level of discretion. Truthfully it gives them an unfettered ability to mount an internal coup against the very concept of the individual and the rational mind. The essence of what our economy and existing society and the US Constitution are all based on. You don’t need to amend the US Constitution if you simply use the schools to make emotion primary, limit facts and literacy, stress vocational skills, and push a collectivist mindset. Plus the idea that some mysterious “common good” is paramount over what an individual can do. Being the intrepid reporter of education that I am, I could only take so much. Especially when the speaker said school board members are the only politicians in America with mandatory training now. 15 hours the first year after election and 9 hours annually after that. All I could think of was that is where the “must defer” mantra was coming from. It also explained how parents elect someone and a year later their board decisions are 180 degrees from what they campaigned on. So I asked:”who did the training?” The state school board association that was already pushing the deference mantra “for the good of the children” was one answer. Law firms was another. Oh good, I thought, the drafter of the charter is then briefing the board on their responsibilities. I think that describes education in an era of Gypsy Supers and personally intrusive legislation and accreditation and duplicitous charters and deferential school boards quite well. So I made the observation that the obligation of training coupled with the real agenda of the accreditors would explain why I was suddenly hearing so many stories of school supers behaving as if they were dictators. An offput presenter responded that the Super “was the CEO of the district.” Wrong answer. I didn’t say this then but I am telling you now. An Educational Leadership degree, especially a doctorate, is absolutely and explicitly NOT about educational administration. Maybe I should have added education professors to the title. If they credential supers to impose radical political theories in classrooms by pretending they are pedagogy and learning theories, are the profs really in charge? Do ed profs get to decide what kind of America we are going to be in the 21st century? I already knew that the Educational Leadership degree rejected an administration orientation. Its recipients are to use the degree to have the power to push Human Development Theory. I know you will be shocked that phrase took me back to John Dewey and his goals and forward back to UNESCO’s. But I also happened to have a March 2007 document from Vanderbilt called “Assessing Learner-Centered Leadership: Connections to Research, Professional Standards, and Current Practices”. It laid out how to use the degree to advance the radical change students to change society vision. It especially noted using the degree to push this new vision for learning and the social learning emphasis. So once again I ask the question: why are school board members being told to defer to supers and accreditors given these political realities? Who then can protect students and taxpayers from being victimized? It explains the lucrative phenomenon quite well. Engrenage is a term that describes the breaking into pieces of the controversial elements so it is much more difficult to see the big picture of the desired cultural, political, and economic transformation. It also allows people “just doing their job” to be pushing something much more far reaching in impact than they may appreciate. Engrenage refers to gearing because the pieces still work together even if that is not commonly appreciated. Does Purple America Come with a Toy Dinosaur or is it Just More SEL? For those of you still upset by the June 11 post http://www.invisibleserfscollar.com/how-social-and-emotional-learning-as-the-primary-focus-is-coming-in-all-the-windows/ , today will be more of the same except this time it is backed up by the NEA. The National Education Association is a hugely influential US lobby and teachers association and financial contributor to elections at all levels. It is sort of a superunion since it does more than represent teachers. But that’s where its dollars and tremendous reach into every school district and electoral nook and cranny in the US come from. Well I suppose that might be OK if we were just talking about troubled schools or schools where students are struggling to have any positive role models or healthy personal visions in their lives. Alas, that is clearly not what the NEA has in mind as the market for Purple America. Are you as parents or taxpayers likely to know this is occurring in your local schools? No. As you are probably beginning to appreciate by now the banner of Common Core is being used to smuggle in a lot of dramatic changes that are the opposite of national criteria for content to be learned. In that soon to be antique notion of learning as actually knowing anything in your own mind. No Purple America is designed to be an integrated curriculum that can be embedded in any subject area for some good old fashioned authentic learning. It’s designed to get the whole school passionate about civic involvement. Much more exciting than studying the history of the country you want to try to change. Now Purple America says it is not a political organization. It believes that we need to Re-Imagine America (that’s a registered trademark too) that is fully committed to its values. These values it says are not red or blue. The values Purple America wants to push are Equality, Faith, Family, Freedom, Love and Respect, Self-Expression, Doing the Right Thing, Community, Giving Back, the Good Life, Opportunity and Success. Again not to worry I know the NEA reps will have the exact same definitions of each of those terms as what you would have explained to your child. I know there’s no need to point out that those may be nice qualities to discuss in an informal setting. But mandating it in the classroom and then keeping track of Which student believes What, and where they are on the continuum of accepting Officially Desired Views, is deeply violating. And if it seems I am just being paranoid, yesterday the Common Core Career Ready Practices were released. They insist that each career-ready student must “understand the obligations and responsibilities of being a member of a community.” That’s certainly consistent with always reminding people that they are not an individual entitled to liberty and privacy and autonomy. The long sought goal of telling people they only really become a person in their relations to others. That they are nothing in their own right is a pretty lousy thing to convince American students of. The person-in-community concept is not the individual Western culture or the free markets that brought so much economic prosperity developed around. Sounds transformational. As if societies are created in the first place and can simply be redesigned with sufficient political will and collective imagination. New readers may want to revisit this post to appreciate this is not a new goal for education.http://www.invisibleserfscollar.com/is-common-core-a-catalyst-to-dramatically-alter-system/ I mean it would be so much trouble to rewrite the US Constitution. Let’s just use education to change what a majority of the future voters will believe it means. How much easier is that? Stealthier too. We have talked before how the bullying emphasis and School Climate brings in PBIS for all and the social and emotional emphasis in the classroom. Project Love and Purple America proudly proclaim their intentions to train for “values-in-action.” I have many new readers from many parts of the US and the world. That’s why I went back and gave links to especially important previous foundational posts. Is there anybody still reading who can avoid appreciating now that this is education as a social, political, and economic weapon? That what’s to be transformed is the US and the West away from the traditions and practices and knowledge that brought unprecedented prosperity? There’s a lot at stake in the education masquerade. But we’re up for the challenge, aren’t we? I bet we know our history better too. For those of you who have read all along and saw I was clearly moving somewhere in particular this is the magic moment when I get to holler “we’re here!” Unfortunately, all those mysterious defined terms like engrenage and dirigiste were created for a reason. I needed them to ultimately discuss the hows of the death of the individual. And the linked demise of economic freedom. And since as I keep saying that individual liberty and economic freedom for each person to pursue their dreams and buy and sell what seems to be needed have always been essential for widespread prosperity, we need to talk about this now. Right before the international UN sustainability conference called Rio+20 that is just cranking up as I write. I see our Secretary of State Hillary Clinton is leading the US delegation. Not to be mean, well maybe just a little, but all the talk about charters and accreditation and gypsy principals and supers and Quality Learning and SEL and outcomes based education and UNESCO were all essential to lay a foundation. I needed you to stop thinking of education as necessarily being a good thing. It should be but now it has become the most valuable and potent weapon available for the scheming set. And their mediocre allies who are perfectly willing to push any idea that allows them to live at the expense of other people. Now I happen to know for a fact that the Belmont Challenge goal that “global energy security be provided entirely by sources that are renewable and have neutral impacts on other aspects of global sustainability” is impossible. Even trying will send us all hurtling back towards the limited lives of Middle Age serfs without air conditioning or cars or widespread food production or distance travel. If not caves and fires. So when you hear an education proposal from now on, ask if it is trying to strengthen individual independence, actual knowledge, genuine innovation, and people’s ability to interact and cooperate with each other as they see needs and wants. Without the need to get anyone’s consent. Otherwise I want you to think of locusts coming after a field of wheat ready to be made into life-sustaining grains. They are coming because they can and they are hungry. It is better to know they are coming if we are to have any chance of protecting the wheat. Maybe harvest it early and put it into padlocked silos. Otherwise we will be discussing what happened from a barren field with the threat of famine ahead. Mind arson may be a provocative term but it is also an accurate term for this official agenda we have been discussing. I have not read or heard of any coverage of either the Belmont Forum or the Belmont Challenge. My knowledge of it comes from documents obtained as I tracked education initiatives from the March 2012 Planet under Pressure Conference. They were located on computer servers outside any of the participating countries. I guess that’s convenient. It will take me several posts to lay out what people almost everywhere should be aware of. The US National Science Foundation and the UK Natural Environment Research Council manage the Belmont Challenge to lay out and mandate a Roadmap to ensure “equitable economic and social development”. The final version of the Challenge was issued March 2011. The Challenge is founded on the basic belief that “the environment and human society” are “interconnected systems.” The problem is that is not a factual statement. It is a political aspiration. A global one. The kind that will take lots of taxpayer money and public policy directives and radical changes to the purpose and results of education. Public policies based on 10 year models or guesses about the world and what might happen in the future. Wishful thinking that if these desired changes we are seeing in those UN Millenium Development Goals and its Education for All initiatives are imposed all over the world through Quality Assurance and the US Common Core and Australia’s Core Skills Framework, these political theories may create human behavior that can be reliably predicted. But with enough emphasis on basic skills and concepts accessible to all and emotion and limiting literacy, apparently the schemers hope that human behavior can become predictable. And desired priorities for future living will become automatic. A reflex. What Happens When a Charter Pillages Minds and Wallets? Raise your hand if you remember to substitute the words “binding contract among the parties” every time you hear the word charter in education. A charter school. Now charter districts. In life your intentions may make you a fine person or an evil one or somewhere in between. But as a legal matter intentions cease to matter when you sign a contract. Its words now control. They dictate the relationships among the parties. Now those of you who have joined me as readers from the Get Schooled blog know I have a running joke about Attentive Parent’s Glossary of Words. That I should publish it as a dictionary because so many of the commonly used terms and slogans in education actually have far different meanings than what is commonly appreciated. Now think about the implications of that for a minute when those words get put into a formal education statute or regulation or a charter. It’s bad in all three instances because the side providing the money is not really going to get what they think they are getting. That’s the beauty of Orwellian Newspeak–the duplicitous use of language. It makes it a whole lot harder to detect the problem. If you do though, at least you can lobby politicians to change or repeal a law. Where do you go to appeal a legally binding contract that was intended by one side (has the accurate knowledge and is in charge of daily operations) to operate differently from what the other side (providing the money and children) thought they were getting from the charter? Welcome to the dangerous world of charters in education. And yes I was a corporate lawyer in charge of negotiating contracts in an earlier version of my life. Contracts to me are close to living things. I never forget that the only time anyone ever reads a contract is when the parties have ceased to agree. So it needs to be written accurately while everyone is still getting along. In education charters though one side may not have any real effective means of appreciating that there was never a point when both sides were in agreement about what was supposed to happen in that school or district. In fact the charter becomes an effective weapon for making the deception over intended results legally binding. And to accelerate the speed at which radical education reform is being brought to a public school or district you are financing with your taxes. That money you must pay annually that then limits what else you can buy. Which limits what other people in turn make from sales. Which limits their income. But not their property taxes that finance so much of education. On June 1, a 93,000 student school district with an over billion dollar annual budget became the largest charter school district in Georgia. A state that seems determined to pilot cutting edge radical ed reform. Usually because there is some poorly understood federal grant of money involved. It’s not alone in that category of destructive fundraising though so don’t gloat too much if you live somewhere else. EdWeek did a story on the charter calling it a “gamechanger.” Yes I have no doubt it was intended to be a national model. The language is simply too tied in with some of the most controversial or nefarious schemes in using education as a social and political weapon. What do I mean for example? Well if you have been reading all along you know I mention something called Transformational Outcomes Based Education as the end game. Fundamentally change the student from the inside-out. What she values, believes, and how she behaves. Make responding from emotion a habit and logical, abstract thinking a rare, maybe even impossible, event. Cultivate a sense of being part of a group instead of being an independent individual. My nickname for Transformational OBE is intellectual totalitarianism. But then I love history and recognize the characteristics and dangers of a government officially limiting what its future voters may know or be able to do. So when I see language in the charter that I recognize as coming from the OBE scheming it is alarming. When I recognize tools that the designers created to use education as a weapon to change American society or its economy or quietly shift its political structure that’s unacceptable. Contractually mandated policies and practices that track back to what a long dead schemer believed would make it much more difficult for the US to prevail against the Soviet Union in the Cold War. That’s a problem too. You get my drift. If education is a legal, social, economic, and political weapon, charters are a dangerous and poorly understood major means for going on offense. And very intentionally so. You see it turns out that schemers back in the 1970s first began to appreciate that charters could be used as a stealth weapon to force schools and districts to implement radical ed reform with fidelity. No deviations allowed. Legally bound to the script. In 1988, getting ready for the 2nd attempt at national ed reform, one of the regional ed labs (that’s your money) formalized the charter plan for radically restructuring the mission of schools. A new transformative vision quietly placed in those unassuming counterintuitive words of the charter. A vision that could not be legally altered for 5 or 10 years of finally actually piloting the political theories. Even the national unions became involved in 1988 behind the idea of using charters to make education about reaching the 80% of students who did not thrive in a traditional, transmission of knowledge approach to schooling. Except the new approach would bind 100% of the students. Finally and successfully using public education for a levelling purpose. To finally create equality. Even if all were left in an intellectual basement together. Socializing and feeling and being guided. Now I wish there was humor in this post about a lethal vision. I think we will have to settle for irony this time. At almost the precise moment of victory. As this vision to use charters to radically transform education in a binding, untouchable way in high-performing suburban districts finally got under way. The tax paid schemers got caught. Thoroughly. Spread the word. It’s the primary weapon we have for fighting back. Is Accreditation the Enforcer for UNESCO’s Vision of Solidarity? From its beginning UNESCO and other UN affiliates refused to see education, science or culture (the “E, S, and C” in the name) as most of us would. And do as we pay those property taxes and income taxes and tuition and student loans. Things to be cherished and nurtured and transmitted and built up. To the best of each of our abilities. Instead each of these treasures of the ages is viewed as a tool to create social change. In order to build up a new vision for what people could be like in the future. Now a knowledge of history tells us that this has never worked well. It was behind many of the tragedies of the 20th century and before. UNESCO’s designers though believed they could create new norms of moral responsibility and human conduct and then find allies to enforce them. Leaving all of us unsuspecting of course since none of us like to feel we are being managed by others. Especially at our own expense. But since the late 1940s UNESCO has dreamed of using education to promote the intellectual and moral solidarity of mankind. All of us. Well we know from the previous post on what Quality in education really means that individuals abandoning logic and reason and any real ability to think abstractly is precisely what certain utopian or just greedy schemers have been targeting for 100 years. Since John Dewey and then Ralph Tyler and Professor Bode and their 8 Year Study we discussed on May 15 and May 16 in previous posts. That’s in the fundamentally reoriented and restructured world where UN agencies and their employees will take the lead in integrating “social, economic and environmental policy” at the local, national, and global levels. And that aspiration is from the March 2012 State of the Planet Declaration getting ready for the Rio Conference in mid-June so the ink is barely dry. Does that aspiration seem silly to you? Impossible? Something that should earn a ticket to a Mad Hatters Tea Party? Me too. Here’s the thing though with these aspirations that involve using our money and political power to Try to control us and our behavior. It doesn’t have to be possible for it to be tried. And great, expensive, difficult to fix harm can still flow from simply attempting bad ideas and impossible feats. That’s why we are talking about this now. Before Rio. Before Common Core’s full implementation. While the accreditors like AdvancED or New England are moving their devoted Gypsy Principals and Gypsy Supers and others into place to enforce this vision. Whether anyone involved truly appreciates or is even aware of the full vision behind what they are promoting and requiring. As I have mentioned before, we have an autopsy to perform as to what happened and why with education. Right now we need to slow and stop any more damage from these misguided but official policies and practices. Coming to a school and district near you right now. So the UN agencies like UNESCO and others use the so-called Quality Assurance process to systematically review education programs around the world for compliance with its vision. In fact in 2002 UNESCO created the Global Forum on International Quality Assurance, Accreditation and the Recognition of Qualifications in Higher Education to act as the coordinator of that vision. We in the US and my readers in other countries thus have a real problem. The regional accreditors we think are local and checking to ensure academic excellence are using accreditation and their almost dictatorial power over the schools, including many private, and higher ed to pursue a much different vision for education. Some of it we have already talked about. More will come out. None of it is good. Some of it may feel treasonous. All of it though is part of a group of people we are largely unaware of actively coordinating to implement a common global purpose. And no one told us or asked our permission and it absolutely cannot work as envisioned. And the attempts may wreck us all. It really is past time for school officials and the accreditors themselves to be forthcoming with the public that pays all the bills.